Have You Filled a Bucket Today? 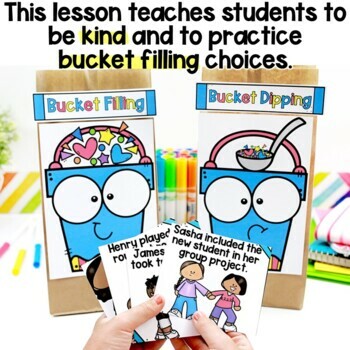 Bucket Fillers Craft, Bag Sorting Game, & More! Have You Filled a Bucket Today? by Carol McCloud is the absolute BEST resource for teaching little ones about kindness and a GAME-CHANGER for classroom management, behavior, and climate! I have used this story every single year: once at the beginning of the year to introduce the topic and then again mid-year for a refresher! If you don't own the story, you can purchase it here, or you can use this free YouTube video read aloud! 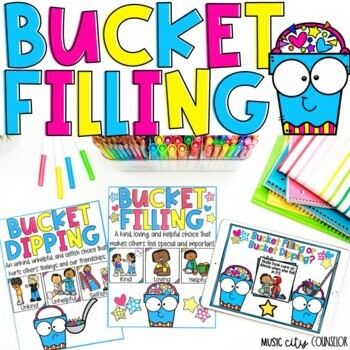 Adorable instructional posters that teach students to differentiate between Bucket Fillers & Bucket Dippers! A super fun, differentiated Bucket Filler Craftivity that makes for a meaningful hallway display! 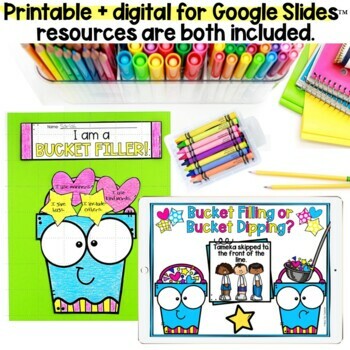 Materials for a Fill My Bucket Chant circle time activity! 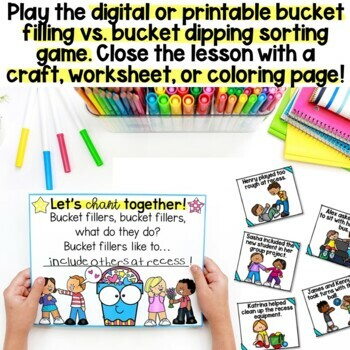 A Bucket Fillers vs. Bucket Dippers Bag Sorting Scenario Game with 24 scenario cards and cute materials to decorate your brown paper sacks! 5 additional worksheets/coloring pages, including a cut/paste scenario sorting activity! Document that shows how the lesson is aligned to ASCA National Standards! All materials available in full color and black/white! * I used 2 brown paper sacks, 1 sheet of 12x18 construction paper per student, a bucket, a pitcher of water, food coloring, and glitter for this lesson! Follow Music City School Counselor on Instagram! Follow Music City School Counselor on Facebook!